dcdomain - r9: What's up with the Batpod? What's up with the Batpod? Did anything bother you about the Dark Knight movie? Anything at all? The first time I saw the Batpod shoot out of the alley and turn 90 degrees to face the Joker... I thought daaaaamn that's so badass. I didn't know what the hell happened to the front end to enable the twin guns to rotate in that fashion (like a gatling gun), but it looked cool as hell. Leading up to the movie, I wasn't all that excited about the Batpod. It just didn't look practical like the Tumbler. A motorcycle is for high speed maneuvering in tight spaces. Making the Batpod look like the Dodge Tomahawk bike negates the very concept of a bike. But when we got to the scene where the genesis of the bike was through the repurposing of the Tumbler's parts, my doubts dissipated. 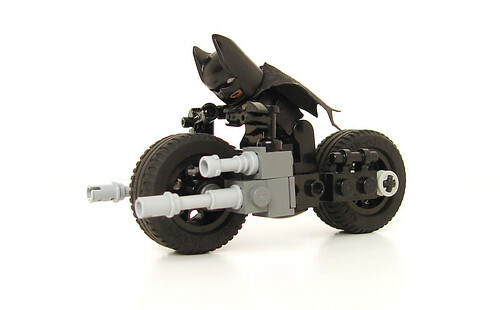 But now that I've viewed the alley scene a few more times (via this LA Times video, History Channel's Batman Unmasked and Batman Tech) the idea of an engineer allowing the front wheel to rotate in a manner that could possibly damage the guns, it just doesn't sit well with me. Flipping the wheel over and over at high speeds on top of the guns, aren't you just asking for something to malfunction at a crucial time? Makes no sense! Why not widen the placement of the guns and mount them to the overall body so that the wheel itself is the only object that rotates? Anyway, a minor quibble on an awesome movie. Lego Batpod above by Lego freak, Gorazd Vahen. Here's something I don't really understand. In the first movie, the Tumbler was originally a vehicle that let the military build temporary bridges over short spans. If that's the case, why would they need to create an ejection system that shoots out as a motorcycle? even if the guns are mounted away from the wheel to enable rotation in perpendicular axis, there has to be some mounting to hold the wheel, that mounting will get damaged with each rotation. i believe that such a bike can never be stable by design . actually, the design is verymuch possible and realistic. just that its bit different than what was shown in pics/movie.